Exuberant Suite will surely be appreciated by high-profile businessmen, as well as couples with children, or happy newlyweds. 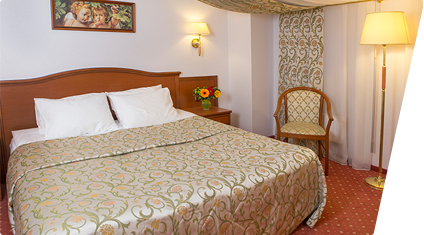 The suite consists of 2 rooms – a spacious bedroom and a cozy living room. 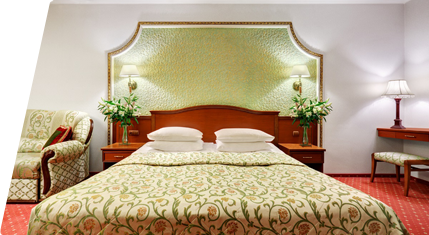 You will surely enjoy the excellent soft furniture, bathroom with a classic bathtub, bidet, and underfloor heating. Genuine mansard-type windows add to the suite's cozy and home-like atmosphere. Suite area – 39 m2. Price – from 11 900 RUR. 2 bottles of natural water upon arrival, chocolate, a set of instant tea and coffee, fresh fruit and flowers. Daily cleaning in the room (bed linen and towels are also changed daily). The rooms at "Assambleya Nikitskaya"